Favor Days carries a fun selection of practical wedding favors that are perfect for kitchen themed bridal showers or even as favors for weddings where the bride and groom love to cook. Some of the kitchen-friendly favors include salt and pepper shakers, cake servers, cookie cutters, tea infusers, measuring spoons, and so many other choices. If you're planning a kitchen themed bridal shower, you might consider asking your guests to bring along their favorite recipe for the bride to start her recipe box collection. Or, if the shower is theme based, you can ask for recipes based on that particular theme. For example, if you are planning a bridal shower tea with desserts, you might ask for your favorite dessert recipes for the bride. 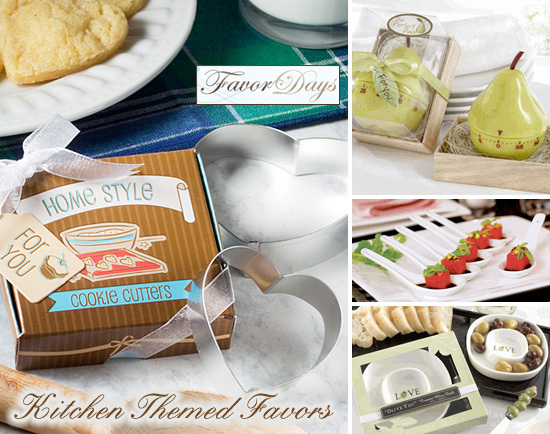 To see all of the practical favors from Favor Days, including kitchen and cooking favors, cookie cutter favors, cake server favors, and salt & pepper shaker favors, please click here. What is your favorite kitchen themed wedding favor?